I have been involved with a new publishing venue for a little while, and I figured that it was about time I shared it with everyone. It’s still in beta, but that doesn’t mean you can’t jump in and see what it’s all about. 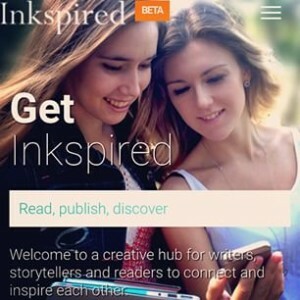 It is called Inkspired, and it is a free, serial-friendly publishing and reading portal. It’s pretty simple to use: as a writer, you copy in your story, fill in a few details, and click ‘publish’; as a reader, you can read stories on the website or through the app. Let’s get the scary legal stuff out of the way: Inkspired don’t take any rights to your work; it all stays with the author. You’re free to do whatever you want with anything you post up there and you’re not tied to them in any way. Basic text formatting only. If you want something complex, this probably isn’t the venue for you. Automatic notifications to readers who follow your story, whenever a new chapter is published. Automatic reminders when you’re approaching your next chapter due date. The ability to send broadcast updates to your followers. Reviews on a chapter before it is published**. Comments from readers on published chapters, and the ability to reply to them. * The site is pretty new and the reader base is pretty fledgling-sized. I’d be curious about their actual numbers and how it goes as the reader base grows. ** This is a new feature, added for a recent event I held for them. Writers can get comments directly on a draft of a chapter from invited Inkspired users. It’s great! Some functionality still being ironed out here, though. I think it’s a professional-looking site and pretty reliable. The creators are open to feedback and have implemented a bunch of features from suggestions. There’s a donation system on the way, so readers can donate to their favourite authors/stories, and likely to be other features in the works I haven’t heard about yet. Overall, I’m still not sure what I think about it; it’s early days. I like the site and the interaction with the readership. I like that it’s easy, and looks good without much effort on my part. I like that people are discovering my stories on there (more on them soon! ), liking and following them, and I get happy little notifications when that happens. It’s still growing and developing, and it’s exciting to see it shift and change, especially when I get to have input into those changes. At this point, I can’t really tell how the long term or the big picture is going to pan out. Is it a good publishing portal? Will it be successful? I’m not sure and don’t really have the direct experience to predict it. I hope it does work out. Right now, I’m treating Inkspired as an experiment for me, my writing, and publishing. I’m trying different things, and trying to get the word out there to see what input others have on the subject. Already, I’ve had it compared to Wattpad and realised that they’re fairly similar. As a result, I’m considering doing a compare-and-contrast with Wattpad, just to see what’s what. As part of my work with Inkspired’s creators (they are local to me here in Brisbane), I ran an event with them recently that we dubbed the Write – Review – Publish event. It went well and was an interesting endeavour, and I hope to do something similar again soon. I’ll write more on this when I’ve had a chance to digest it more fully. Hopefully, there will be a lot more news on this front over the next little while. Fingers crossed! In the meantime, I’d love to know what you think about Inkspired.